Rafael Nadal has conceded he was not yet at the physical level to compete against a dominant Novak Djokovic in the Australian Open final after his return from injury. In his first official tournament since the US Open last year, Nadal did not drop a set en route to his fifth final at Melbourne Park but he was outclassed by a brilliant performance from the world No.1 in three sets 6-3 6-2 6-3. Nadal, who had ankle surgery in the off-season, said he still needed to find another level in his game to be able to match the seven-time Australian Open champion. "He played, I think, fantastic. At the same time is true that when he's playing that way, I think I needed something else,'' Nadal said. "I was not able to have that extra thing tonight, being honest, no? Yeah, was unbelievable the way that he played, no doubt about that. "But at the same time is true that probably physically I was not able. I played fantastic tennis during both weeks, is true, but probably playing that well, I didn't suffer much during the both weeks. "Five months without competing, having that big challenge in front of me, I needed something else. That something else probably today, I don't have it yet." Despite losing his fourth final at the Australian Open, Nadal, the 2009 champion at Melbourne Park, said he could not be unhappy about his performance in the past two weeks. "Is not the first meeting that we had. Is not the first time that he beat me that way,'' Nadal said. "The only thing that I said is even if I was playing so well and I had a great two weeks, being honest, I can't be sad. Will be not fair to be sad. "I played against a player that today was better than me. That's no doubt about that. broken in his first service game. But the Spaniard insisted it was not nerves that hit him, but Djokovic's pressure that had forced his errors. "I make more mistakes because he pushed more. That's all. Is not about being more nervous,'' Nadal said. Nadal admitted it was hard to find the answers to combat Djokovic when he was playing so well. "He probably played the best match so far,'' Nadal said. 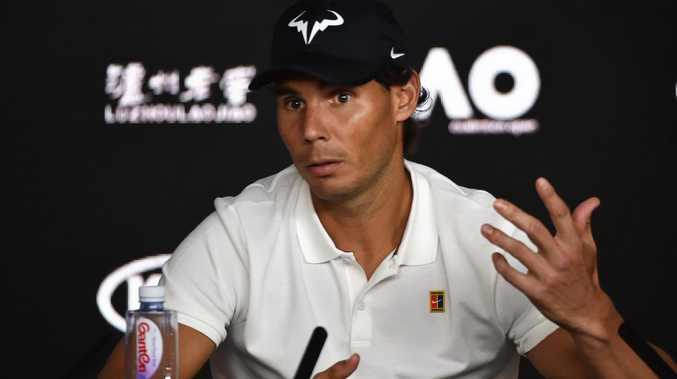 While he acknowledged he needed more games to get back to the level he wanted, Nadal said he would not try to squeeze more tournaments into his schedule and would enjoy some rest ahead of a return to the court in Acapulco and Indian Wells. "I need matches, but I can't go crazy to play matches. I have my age. I have my calendar,'' Nadal said.